There is an interesting paper out there by Guerreiro and Monteiro, published a few months ago in Physics Letters A. It is about evaporating black holes. 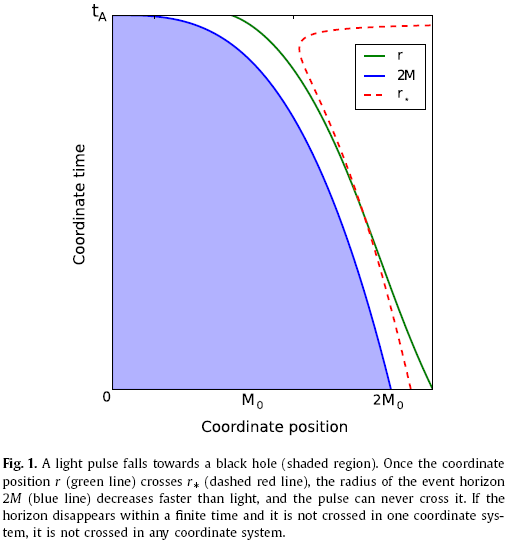 The author’s main assertion is that because of Hawking radiation, not even an infalling ray of light can ever cross the event horizon: rather, the event horizon evaporates faster than the light ray could reach it, neatly solving a bunch of issues and paradoxes associated with black holes and quantum physics, such as the problems with unitarity and information loss. I find this idea intriguing and very appealing to my intuition about black holes. I just read the paper and I cannot spot any obvious errors. I am left wondering if the authors appreciated that the Vaydia metric is not a vacuum metric (indeed, it is easy to prove that a spherically symmetric time-dependent solution of Einstein’s field equations cannot be a vacuum solution; there will always be a radial momentum field, carrying matter out of or into the black hole) but it has no bearing on their conclusions I believe. Now it’s a good question why I am only seeing a paper that is of great interest to me more than six months after its publication. The reason is that although the paper appeared in a pre-eminent journal, it was rejected by the manuscript archive, arxiv.org. This is deeply troubling. The paper is certainly not obviously wrong. It is not plagiarized. Its topic is entirely appropriate to the arXiv subject field to which it was submitted. It is not a duplicate, nor did the authors previously abuse arXiv’s submission system. Yet this paper was rejected. And the most troubling bit is that we do not know why; the rejection policy of arXiv is not only arbitrary, it seems, but also lacks transparency. This manuscript archive is immensely valuable to researchers. It is one of the greatest inventions of the Internet era. I feel nothing but gratitude towards the people who established and maintain this repository. Nonetheless, I do not believe that such an opaque and seemingly arbitrary rejection policy is justifiable. I hope that this will be remedied and that arXiv’s administrators will take the necessary steps to ensure that in the future, rejections are based on sound criteria and the decisions are transparently explained. Viktor, I mentioned this paper to Sabine Hossenfelder on her blog, and obtained her response appearing on April 24, 2017 (then the last comment) . Can you provide a link? There are many entries in Sabine’s blog. In fact I am wondering if she may have discussed this paper a year and a half ago, when it came out… for all I know, perhaps that’s where I read about it first!